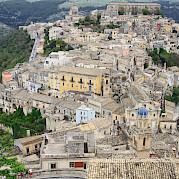 This tour is the same as the Umbria tour except it covers longer distances and is only 8 days long. This road bike tour in Italy runs through the green heart of the country (or il cuor verde d'Italia), which is what Umbria is frequently called. Cycling in Umbria is perfect for those looking to personally experience this unique and unspoiled region with its endless beauty, unparalleled hospitality and just the right combination of art, nature and culture. As one of Italy's smallest regions, Umbria has long been a secret well kept. 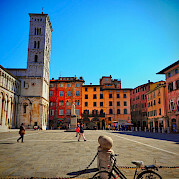 One of the highlights of this bicycle tour in Umbria is the capital, Perugia, with its spectacular Renaissance palaces, museums, churches and tightly wound shopping streets. 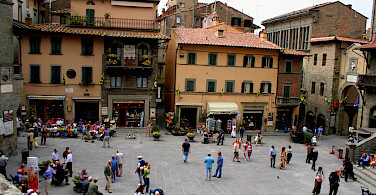 Highlights include the beautiful square Palazzo dei Priori, the 15th century Cathedral of San Lorenzo with interesting pink and white stone decoration modeled after the cathedral of Arezzo in 1335, and the Basilica of San Domenico. 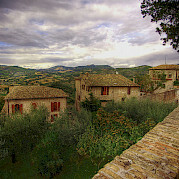 Equally of note will be the medieval Pilgrim town of Assisi. Many monuments have been erected to honor the famous St. Francis, who founded the Franciscan religious order in 1208. 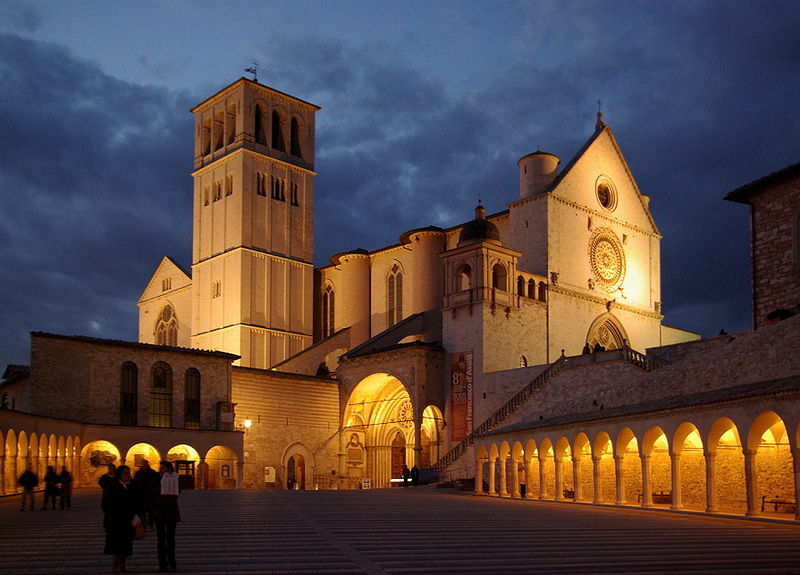 One of the buildings honoring him is a World Heritage Site, the Basilica of San Francesco completed in 1253. 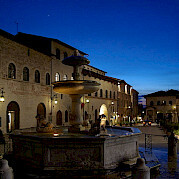 Assisi is also the site of many pilgrimages. 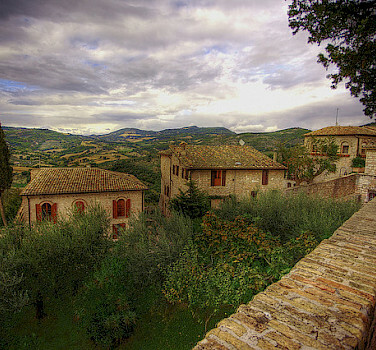 Anyone who calls themself a cyclist must experience biking in Umbria, a jewel of bike tours in Italy. 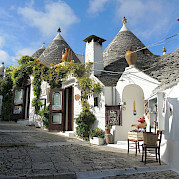 If Umbria is not your thing, check out our full list of bike tours in Italy. *A single room is for those traveling with other companions but wish to have a single room. The price for a single traveler is for those traveling without companions. Train from Rome to Assisi, 3-4 hr. Transfer to starting point. 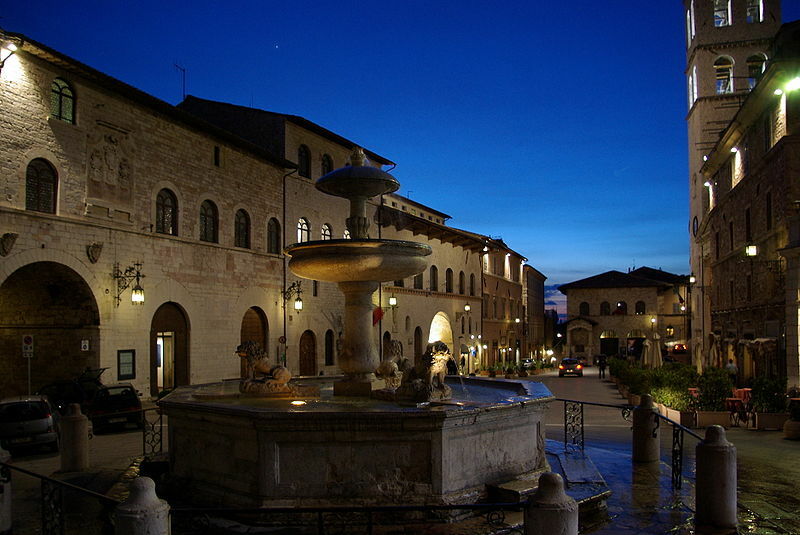 Average high temp in °F for Assisi is 62º in April, 69º May, 77º June, 83º July, 83º August, 76º September & 65º October. A GPS is available for this tour. Standard: Great 3 star to 4 star hotels; rooms with private facilities. DeLuxe: Great 3 star to 4 star hotels and B&Bs, rooms with private facilities. All hotels are slightly higher quality than the Standard hotels, including all hotels have a swimming pool except in Gubbio. 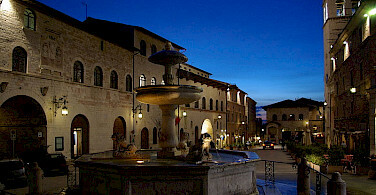 Hotel in Assisi is close to downtown. Extra nights available by request. 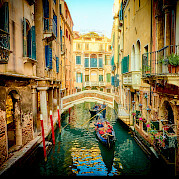 This cycling tour in Italy is classified as difficult, self-guided with distances averaging 65 miles per day over hilly terrain with steep climbs. 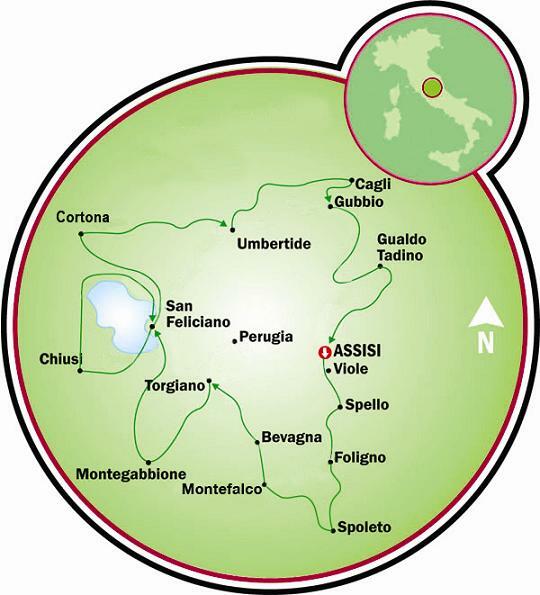 The tour starts in the Pilgrimage city of Assisi, built against the Monte Subasio Mountain. 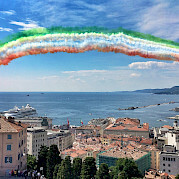 The little city with the towering fort "La Rocca Maggiore" can already be explored on this very first day. 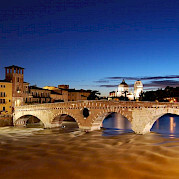 At the end of the afternoon, you will receive the route descriptions, maps, and tourist information from a tour agent. Starting your tour in Spello, you leave your hotel and pedal through the valley of Spoleto, passing Foligno, your route goes up to Montefalco, also called the "balcony of Umbria", because of it's fantastic panorama views. The Franciscan church, now a museum, is decorated with magnificent frescoes from the 15th and 16th century by artists like Benozzo Gozzoli and Perugino. 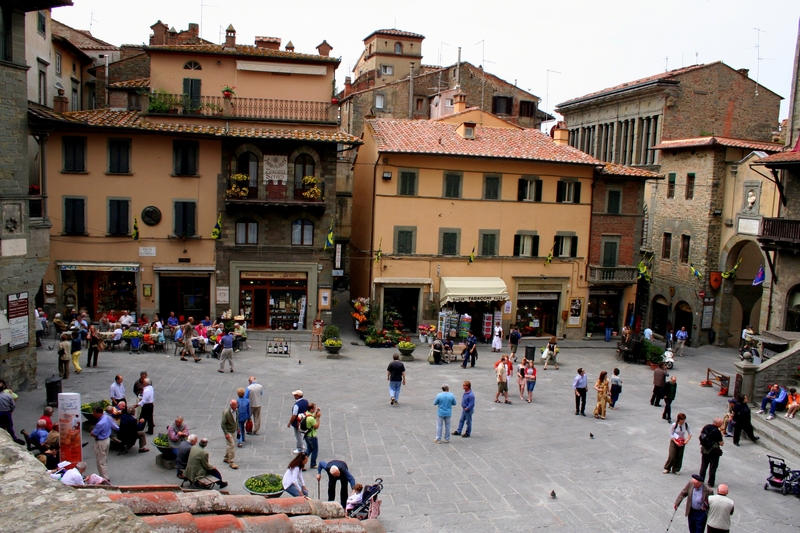 The next town you will visit is Bevagna, whose characteristic medieval square is home to two Romanesque churches. Your overnight stay is in Torgiano, which in medieval times was a fortified village and is situated on a hilltop above the confluence of the Chiascio and Tiber Rivers. Interesting to visit are the wine museum and the 'osteria' of the Lungarotti family, where you can taste their excellent wines. 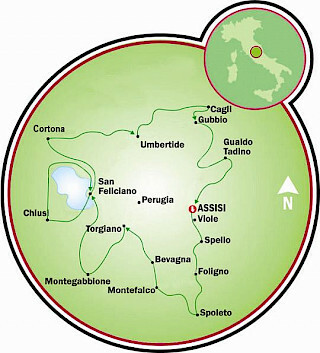 This longer route takes you through the same towns as the above shorter route but also brings you more south through the valley past Foligno towards the town of Spoleto. Today, you will cycle for a while through an uninhabited region of forests with a farmhouse here and there along the way. Cycling in Umbria through this beautiful hilly terrain, you'll unexpectedly arrive at a glorious view over Lake Trasimeno with its 3 small islands. 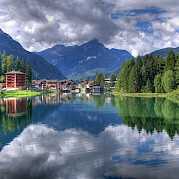 This Lake is the 4th largest in all of Italy with a rich population of fish. 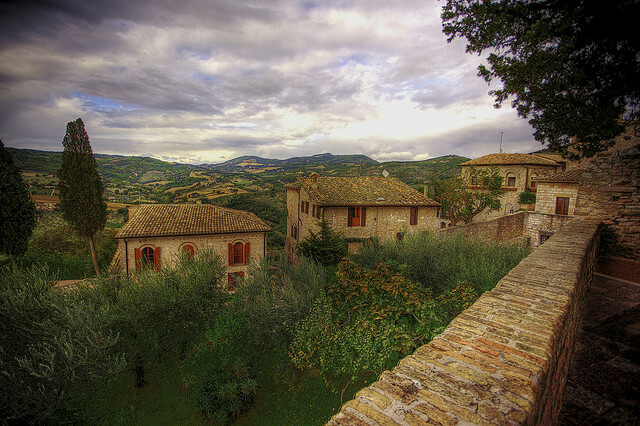 You will pass small, typical Umbrian ‘borghi’ built on a hilltop such as Castiglion del Fosco, Pietrafitta and Panicale, which still has a fascinating, well-preserved 13th century Palazzo del Podestà. Trasimeno Lake, beautifully surrounded by hilly landscapes, attracted much favorable attention during the Middle Ages and Renaissance. It was then that the painter Perugino, teacher of Raphael, often used the Lake as a background for his paintings. Next, you will bike around the Lake, passing the cozy towns of Passignano and Tuoro Lago along the way. Then, you'll leave the Lake behind for a nice visit to the Etruscan city of Chiusi. This quaint city has changed very little over time. Lastly, you'll venture back around Lake Trasimeno and maybe have time to visit one of the islands in the Lake. This shorter ride brings you through unspoiled nature to your destination, the quiet little town of Umbertide. 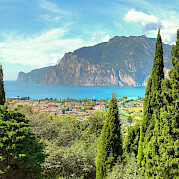 But first, a steep climb brings you to Castel Rigone from where you will have a magnificent view over the lake. From there, a pleasant undulating ride takes you to Umbertide, whose town center is dominated by a majestic tower, the remains of a castle dating back to 1385. A lovely ride through the valley of the Tesse brings you to Cortona. This beautiful, Tuscan town is built on a hilltop. Leaving it, you will cycle over a ridge through a mountainous terrain with magnificent views of the surrounding mountains. Your overnight stay will be just outside Umbertide. Today's destination is the fortified hill town of Gubbio. You will cycle through the mountains. 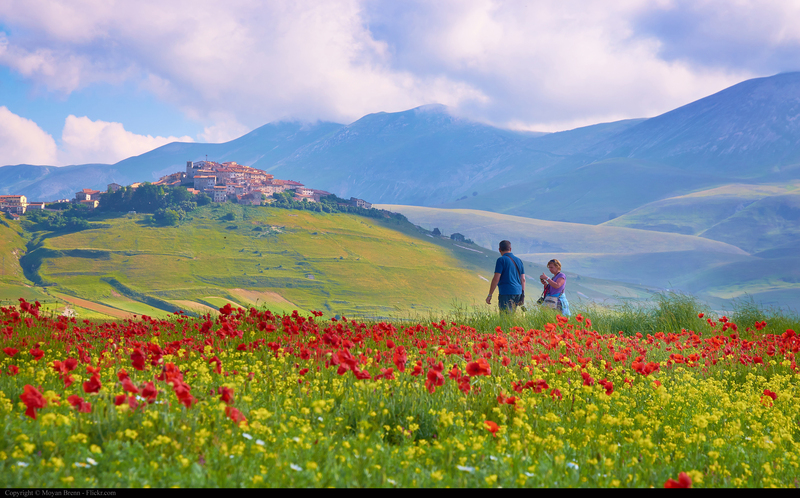 It is a beautiful tour through the green hills of the lower Apennines. 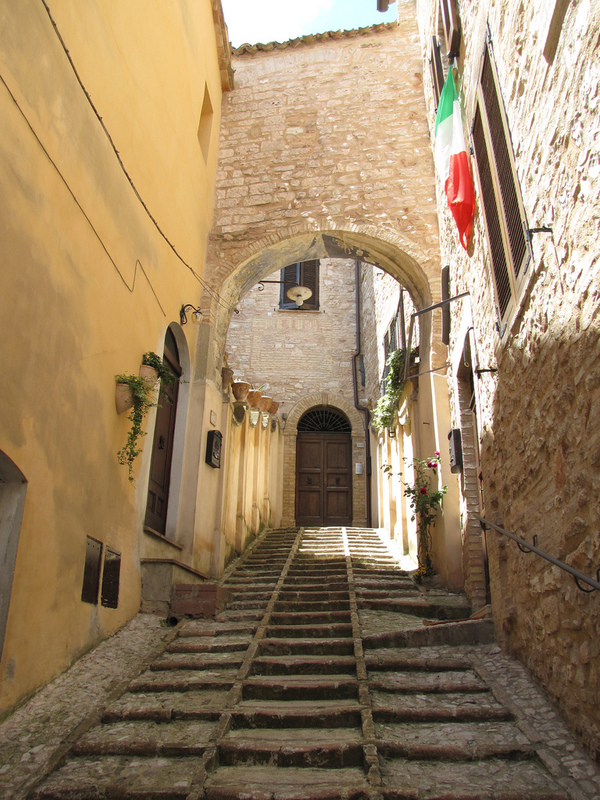 Along the way, visit Montone, a quiet little town built (482m) on a hilly ridge, situated between the Lana and Carpina streams, which are both tributaries of the Tiber. It's a slow climb uphill to Pietralunga with its old partially, walled center and the Long bards Castle dating back to the 8th century. You will pass Cagli in the region Le Marche and from there, you arrive to Gubbio, where your accommodations are right in the town center. On this last day of the tour, you will cycle through a beautiful hilly landscape passing quiet mountain villages. The first stretch begins with a steep climb, but after that, the road undulates gently until it brings you to the bottom of a valley. 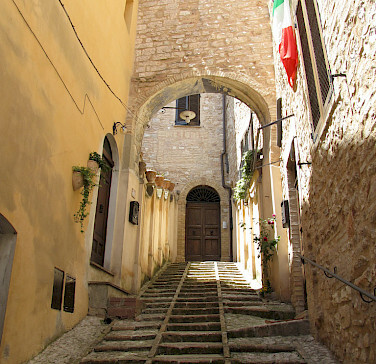 The last stretch brings you through characteristic little villages and finally you will see Assisi from afar, built on a spur of mount Subasio. DAY 8: Departure from Assisi (Viole). Individual departure from Assisi following breakfast. We loved the entire cycling experience! Our stay in Umbertide was especially memorable- the hotel was amazing and the restaurant was some of the best food we ate in Italy!